Editor’s Note: This post has been updated with links to current reviews of the most anticipated 2017 Dining Experiences that have opened so far! Look for UPDATES and links throughout the post. I hope that your 2017 is off to an excellent start and that you’re planning your next trip to Disney Parks for sometime this year! As has been the case for the last few years, Disney has promised some big doin’s coming our way during the calendar year. And oh, well, sure. The entire universe is poised on the edge of its collective seat, awaiting some indication of when Star Wars Land and Toy Story Land will spring to life. BUT — even though we really don’t expect to hear of openings on those fronts in 2017, there’s still PLENTY to look forward to! Oh, wait, was that just me? Anyway, on this day as we gather with family and friends to celebrate Mojitos all around the world ;), we thought we’d show you a mojito in Epcot’s Mexico Pavilion that has more than a bit of a twist… the Pomegranate Lime Frozen Mojito found at La Cantina de San Angel. 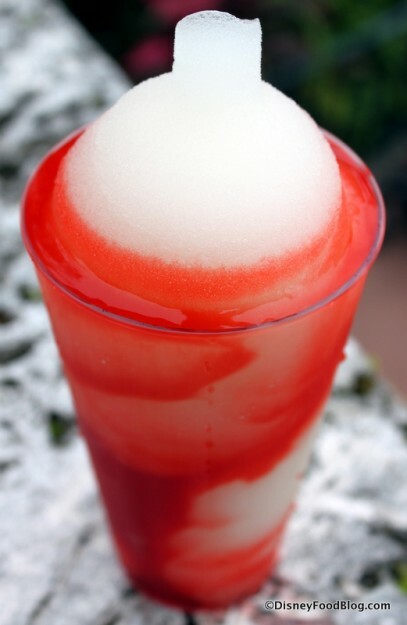 The drink serving is huge – it fills every inch of the glass and beyond, as you can see. (At $11.50, I should hope so.) As a bonus, it’s also looks terrific! A traditional Mojito is a mix of fresh mint, lime, club soda, sugar, and white rum on the rocks. The Pomegranate Lime Frozen Mojito has… well, it’s got lime 🙂 . 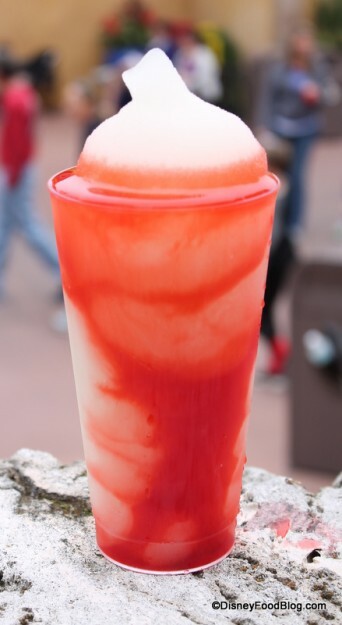 And pomegranate! 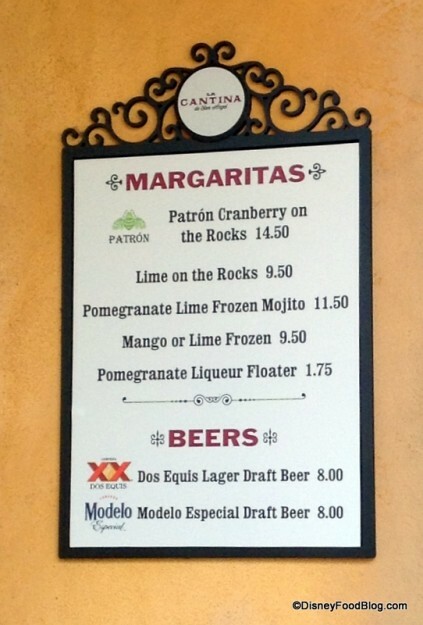 Tequila – as opposed to rum – is the featured liquor here, and I can’t say I picked up one hint of mint. What I did pick up on was a refreshing blast of cold, fruity sweetness nicely balanced by the tart lime. For all my joking about Mojito Day traditions, I’m actually not a huge mojito fan myself, so this version is far more up my alley. 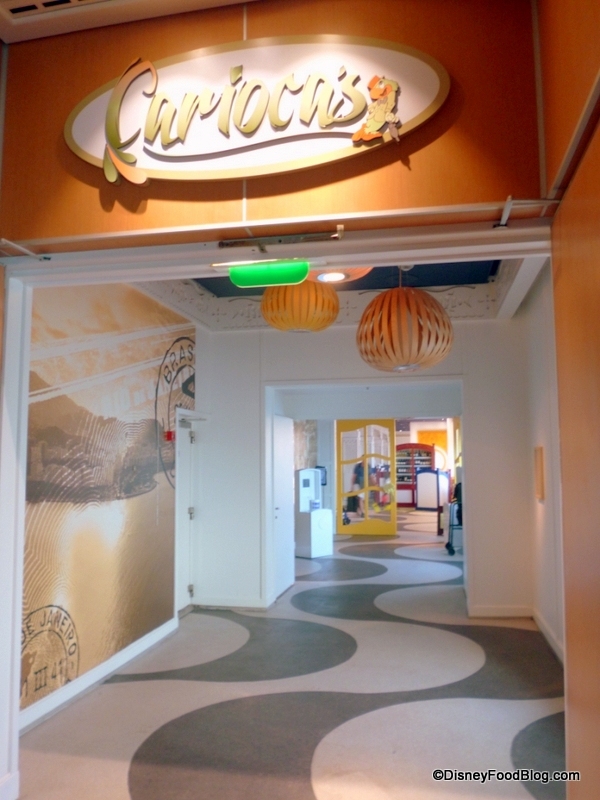 Today we’re visiting the newest Disney dining establishment on the high seas… Carioca’s! The Disney Magic is Disney Cruise Line’s original ship. After fifteen years of sailing, she recently underwent her first lengthy renovation (referred to as a “re-Imagineering” by Disney Cruise Lines 🙂 ). Several of the dining and adult lounge areas were refreshed and enhanced, while others received a complete redesign. With the ship’s launch in 1998 came the introduction of Disney’s unique approach to dinner seating known as Rotational Dining. 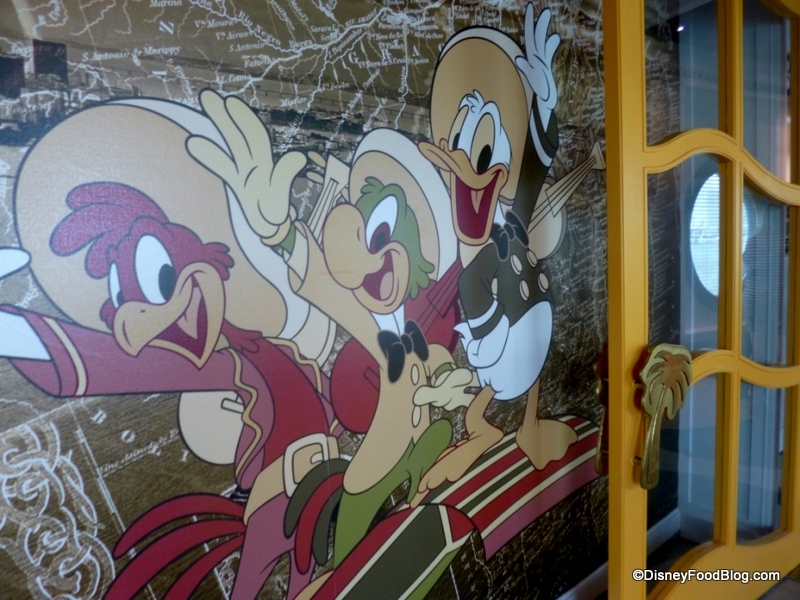 Instead of gathering in one large dining room every night, guests aboard Disney Cruise ships are assigned to a rotation among three different dining rooms. 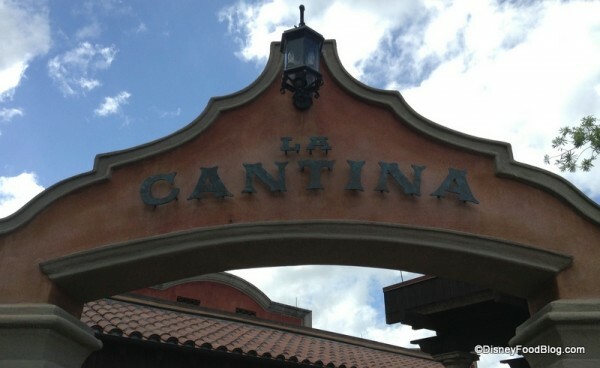 Their table servers rotate with them, getting to know their likes and dislikes (as well as any special dietary needs), allowing for a more seamless dining experience. 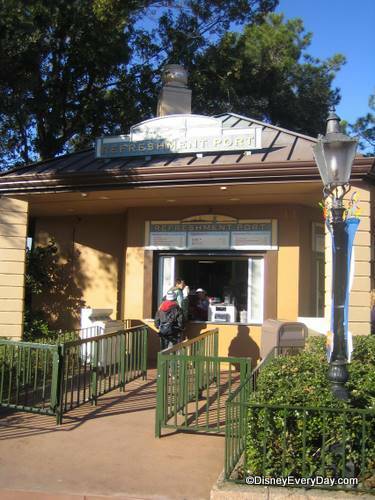 With the Magic’s recent post-renovation relaunch, what was formerly Parrot Cay in the dining rotation has become Carioca’s! 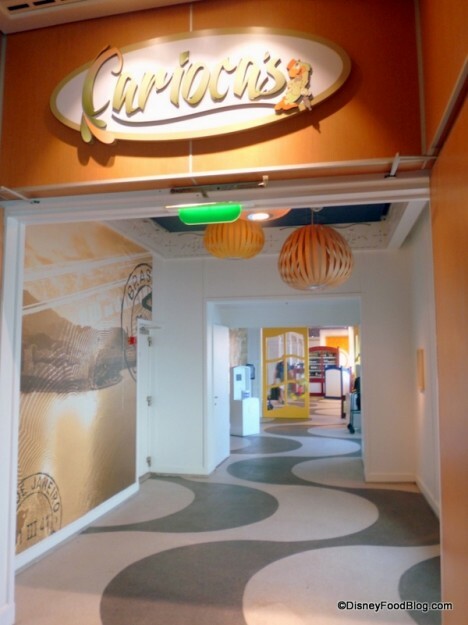 Carioca’s is inspired by and named after Donald Duck’s pal, the one and only José Carioca! You may know José from two Disney films from the early 1940s: Saludos Amigos and The Three Cabelleros. 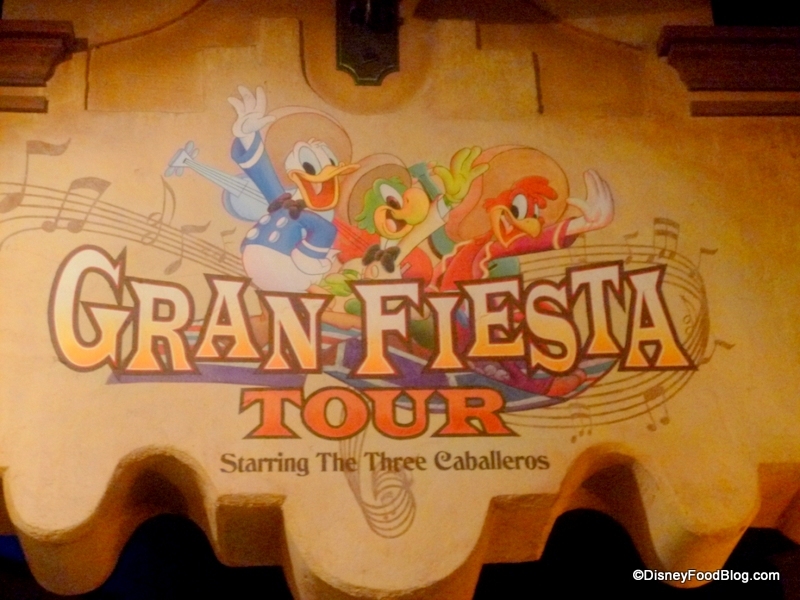 Even if you aren’t familiar with these films, you may have enjoyed sailing and singing along with José, Donald, and their third amigo, Panchito, on the Gran Fiesta Tour Starring The Three Caballeros in Epcot’s Mexico Pavilion! 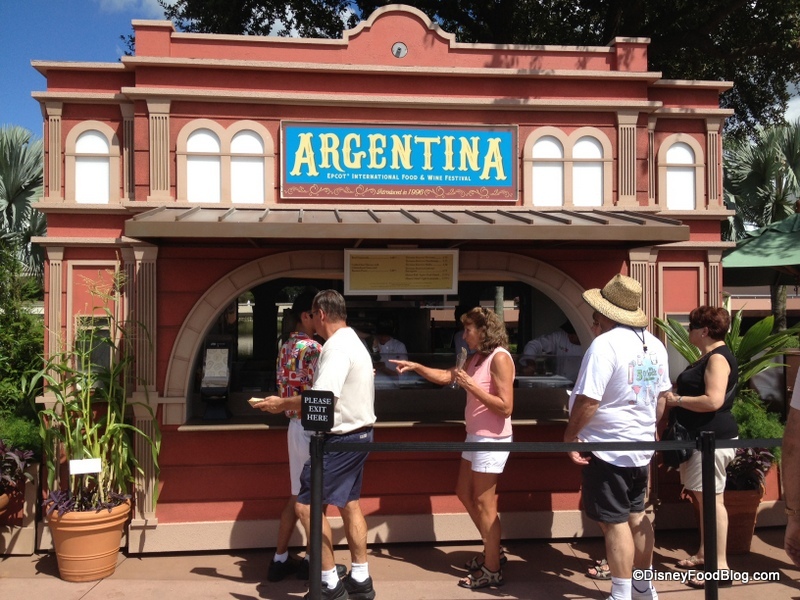 Long gone are the McDo’s fries; in their place is a snappy new menu with Latin favorites at Epcot’s Refreshment Port. 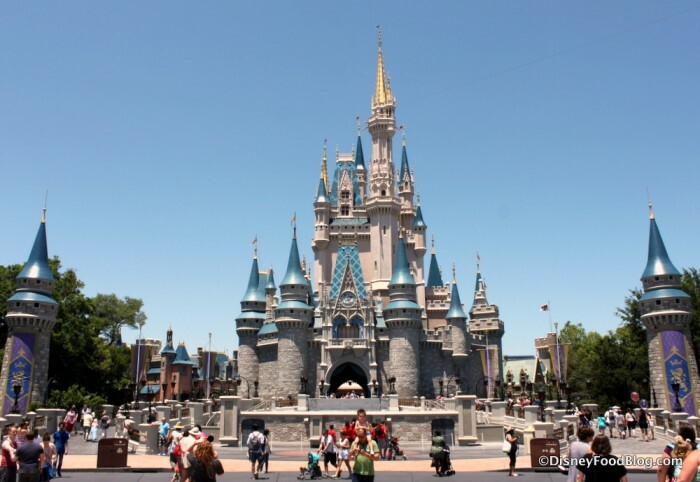 Thanks to Amanda Tinney of DisneyEveryDay.com for this guest post! Adios McDonald’s. Bienvenidos Latin Flair!